I thought that it would be interesting to discuss the literary sources for the horse-racing track in Alexandria, the hippodrome. When the French scholars arrived with Napoleon, a Roman-style circus or chariot-racing track was still visible just behind the Serapeum. The spina or central barrier showed that it was used for this purpose; the narrowness of the track suggested that it had originally been a Greek hippodrome. The track was in a depression, which meant that the audience seats could hold a great number. Was this the hippodrome of Alexandria? And when was it built? If we could visit ancient Alexandria by time-machine, these are questions that we could answer easily. But instead we must sift the remains of ancient literature, looking for an allusion or two. The hippodrome actually had a name. It was known as the “Lageion”, after Lagus, the ancestor of the Ptolemaic kings. This we learn from the fragments of Herodian Grammaticus with confirmation from Epiphanius of Salamis. I.e. Λάγειον τὸ ἱπποδρόμιον Ἀλεχανδρείας ἀπὸ Λάγου τινός – Lageion: the hippodrome of Alexandria, after a certain Lagos. 2. vol. 2, p. 458 line 37 to p. 459 line 3. From: Peri orthographias / De orthographia / “On orthography”. Not sure what this is saying: anyone? Which says much the same as #1. However there is a problem with the Lentz edition. Basically it’s fake. The Lentz edition is a modern reconstruction. Only one of Herodian’s works actually survives, which – fortunately for us – is De prosodia catholica. So the first quote is certainly by Herodian. But the rest is made up from fragments; and Eleanor Dickey, who is the expert on these sorts of sources, advises using the original sources instead. For our purposes however the first reference is sufficient. Then ceased the Rabbity (Lagid) kings, the Ptolemies, who were  descended from the Rabbit (Lagos), for whom the race course, when built in Alexandria, was called only in the same Alexandria the Rabbity. One could wish that Epiphanius was slightly less pleased with his own linguistic cleverness here, but the sense is clear enough. The next three texts suggest that the Lageion stood next to the Serapeum. This is compatible with the site found by Napoleon’s men. Papyrus SB 6222 is a letter from an athlete living at Alexandria to his sister. It records the emperor leading a religious procession at the Lageion on the date of a festival of Serapis, 22 December. It’s probably Diocletian in 301 AD. The procession probably relates to the Serapeum. To my dear sister Sophrone, greetings, Dios. Above all I pray to [the lord] god that you are doing well and also that the best things in life may be yours. I am wondering why until today you did not send us a single letter, although every day there are many acquaintances who are traveling north. Yet now, please, write back to us about your and our fathers’ wellbeing. We are glad to be here. I will tell you everything that has happened to me in Alexandria. So, when we arrived here, we didn’t find the person whom we came looking for (but) we did find our lord the emperor visiting. He ordered that athletes be brought to the Campus and fortunately, I and the other five were selected, without the other athletes knowing. When I arrived there, I was at first paired up to do pankration and I had bad luck, as I do not know how to do pankration. So I was performing [poorly] for a long time… falling. The god was about to … I challenged the five to do pammachon. The emperor wanted to know whether I was [immediately) summoned to do it one man after the other. When I saw that [those who fell] were collecting dung from the contest, I challenged them for the pammachon. The prize for us was a linen tunic and hundred guilders. The [linen tunic] is inexpensive, and I received … and I made … debtors (?) and I got a gold coin with the money and the other five the tunic. This happened on the 2?th of Choiak. And on the 26th of the same month he held the festival in the Lageion and we performed there. And I got a silver prize, a sleeveless tunic, and the money. So don’t be sad that we haven’t found the person, for good fortune has given us other things. Take care of your sister… God willing, we will come to meet you after Mecheir, making you happy. Your… sends you many greetings. I greet my dear father and all who love my soul. I pray that you are well, my dear sister, for many years. In the Apothegmata Patrum (Sayings of the Fathers) there is a reference to chariot racing and the Serapeum together. When the Serapeum was overthrown by Theophilus of Alexandria, the news raced down the hill to where a miracle had just happened. The same related that there was a charioteer in Alexandria, whose mother was called Mary. In an equestrian fight he had a fall. Then getting up again he surpassed the men who had overthrown him and carried off the victory. The crowd cried out, ‘The son of Mary has fallen; he has risen again and is the victor.’ While these cries were still being heard, an uproar ran through the crowd in connection with the temple of Serapis; the great Theophilus had gone and overthrown the statue of Serapis and made himself master of the temple. Philostratus, Life of Apollonius of Tyana, book 5, 26. Apollonius goes to the hippodrome, and attacks the crowd for sacrificing at a presumably nearby sanctuary while covered in blood. Possibly the sanctuary is the Serapeum. It’s all a bit speculative, but interesting. 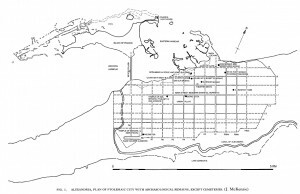 However there was certainly another hippodrome in Alexandria, on the east side. This talks about a hippodrome which was known to Augustus. Below the canal are the Serapion and ancient temples, so to speak abandoned, for the construction of new temples, those of Nicopolis there is also still an amphitheater and the five-year games also take place there, the old buildings are neglected. In short, the city monuments and shrines. The most beautiful is the porticoes have more than one stage. In the city center), the court and public gardens. There is also the Paneion …: from its summit, one can contemplate the whole city, which extends from all parts to its feet. Starting from the Necropolis, – the longitudinal avenue is next to the gymnasium to reach the Canopic Gate; then it is the Hippodrome, as it is called, and the adjacent valleys, as far as the Canopic Canal. As you cross the Hippodrome, you come to Nicopolis, which occupies on the seashore a built surface comparable to that of a city. It is thirty stades from Alexandria. Augustus favoured this place because it was there that he won battle over the troops who were marching against him with Antony. This is not spoken of as near the Serapeum. This discusses a persecution of the Jews in Alexandria under Ptolemy IV Philopator. 4:11. When they had been brought to the place called Schedia and the voyage as determined by the king was over, he ordered them to be thrown into the hippodrome on the outskirts of the city, an immense concourse eminently suitable for making the captives a public example to all who came down to the city and to those who left the city for a sojourn in the country, the purpose being to prevent them from associating with the king’s forces or claiming to be within the precincts of the city. 5:46. About dawn, when the city was already full of innumerable crowds making their way toward the hippodrome, he entered the palace and incited the king to take up the business on hand. 6:16. Just as Eleazar was finishing his prayer, the king arrived at the hippodrome with the beasts and the whole wanton array of his army. And the Jews observed it and raised a great cry to heaven that made the surrounding valleys ring with the is sound and struck uncontrollable terror in all the hosts. Here the hippodrome is in a valley, as the one next to the Serapeum is. Our final Greek reference is in Evagrius, which says that the city tended to assemble there. And that thence resulted still more alarming consequences, from the license of |64 the soldiery towards the wives and daughters of the Alexandrians: that, subsequently, the people, being assembled in the hippodrome, entreated Florus, who was the military commandant, as well as the civil governor, with such urgency as to procure terms for themselves, in the distribution of provisions, of which he had deprived them, as well as the privileges of the baths and spectacles, and all others from which, on account of their turbulence, they had been debarred: that, at his suggestion, Florus presented himself to the people, and pledged himself to that effect, and by this means stopped the sedition for a time. Next we come to Arabic writers. Eutychius (Sa`id ibn Bitriq), PG 111 col. 975A. 22. Ptolemy, the conqueror of Ur, died. After him ruled Ptolemy [I], called Lagus, for twenty-nine years. He built a large hippodrome for horse racing in Alexandria, which was later burned down in the days of King Zeno. After him, his son Ptolemy [II] reigned, called Philadelphus, for twenty-six years. Severus of al-Ashmounein, History of the Patriarchs of the Coptic Church of Alexandria, PO1, p.467, in 539 AD. But the letters of their blessed Father Theodosius came to them from his place of exile, reminding them of the faith, and consoling them, and encouraging them to patience. So when their trouble increased, an assembly of the orthodox met together, priests and laymen, and took counsel together as to building a church in which they might take refuge, so that they might not be like the Jews. And they did what they proposed, and built a church by the power of Christ, in the western part of Alexandria, in the place called the Pillars, or the Serapeum; and this church is the Angelion, which they built secretly at the hundred and five steps. And another congregation of the people also built another church, in the name of Cosmas and Damian, to the east of the amphitheatre, and a little to the west of the colonnade; and they finished it in the year 278 of Diocletian. When the prince learnt this, he sent and opened all the churches, and put them under the authority of the Chalcedonians. So when the blessed Father Theodosius learnt that there remained to him no other than these two newly-built churches, the church of the Angelion, and the church of Cosmas and Damian the Martyrs, he sighed and wept, because he knew the people of Alexandria, and that they loved pomp and honour, and he feared that they would depart from the orthodox Faith, with a view to gaining honour from the prince. The translator has rendered “mal`ab” as amphitheatre but it should be hippodrome. Writing very much later the Arabic writer al-Maqrizi says that the “mal`ab” or hippodrome is the third wonder of Alexandria in his time, after the Pharos and Pompey’s Pillar. Among the marvelous things of Egypt, says Qoda’i, there is Alexandria and the marvels it contains, among which are: the Lighthouse, the Column and the Circus where everyone gathers on a certain day of the year; there, a ball is thrown, and the one in whose lap it fell must infallibly reign over Egypt. At one of these feasts, `Amr ben El’As, who received the ball in his lap, and later in the time of Islam, ruled Egypt. This circus could contain a million spectators who all perfectly saw the one facing them. When a reading was given, the whole world heard it, and if a show was given, everyone saw it distinctly to the end, without being at all obstructed by the multitude of steps which rose before or behind him. There are probably more references, but that’s what I have. Not much, considering the central importance the place obviously played in Alexandrian life. The name of “Lageion” only appears in Roman-period writers. Epiphanius indicates that the building is Ptolemaic, named after Lagus. 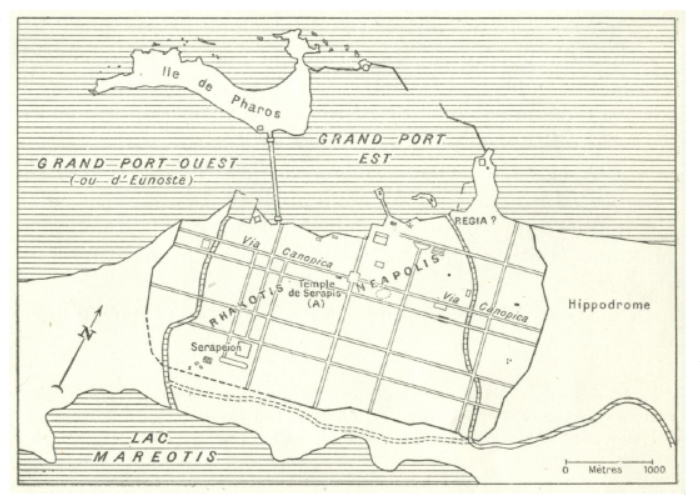 Perhaps the original construction was by Ptolemy II Philadelphus, who built so much of Alexandria, and named it in memory of his grandfather Lagus. But we cannot say this for sure. Obviously it was remodelled in the Roman period to add the spina. 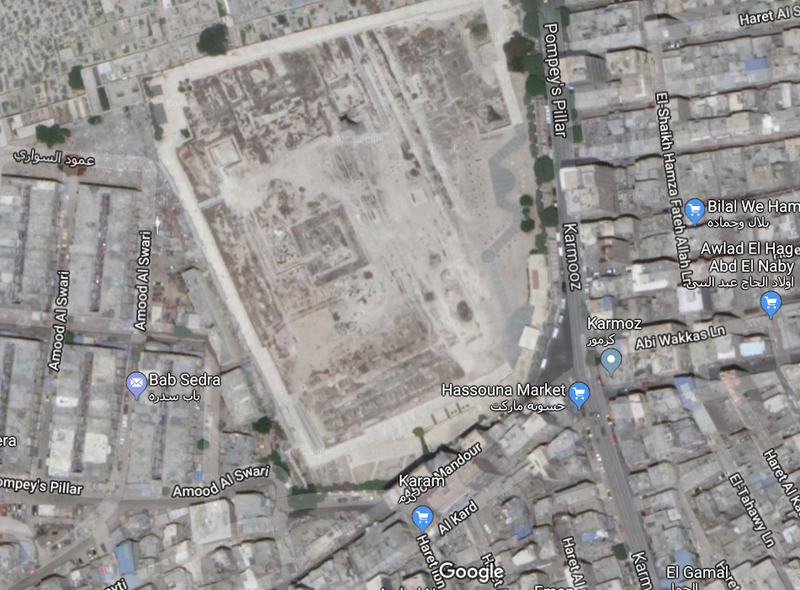 A great deal of discussion has centred around the question of Alexandria’s entertainment buildings, particularly its hippodromes and stadia, of each of which there were probably two. The problems are thorny and caused in no small part by the fact that several different names are used in the ancient sources for the hippodromes (‘Lageion’, ‘hippodrome’ and ‘stadium’). 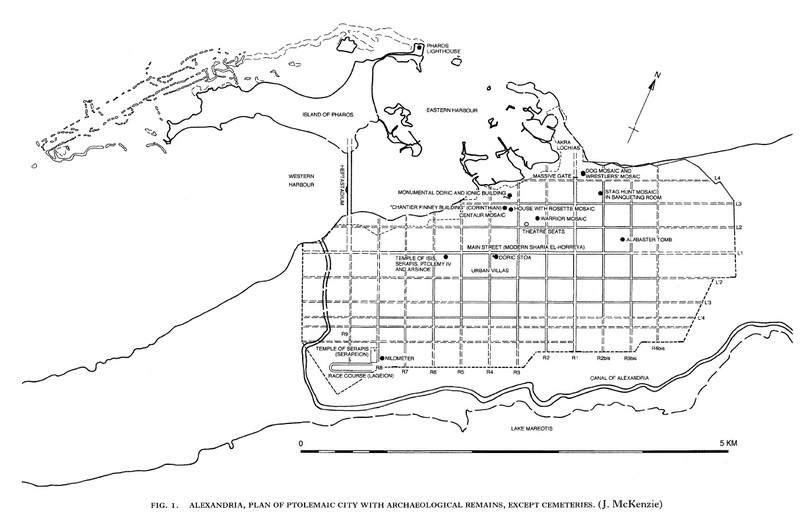 P. M. Fraser, in his monumental study of Ptolemaic Alexandria, reached three conclusions about these entertainment buildings: 1. the third-century BC stadium was in the area of the palaces on the northeast side of the city; 2. a hippodrome referred to by Strabo was located outside the city walls on the east side on the way to the suburb of Nicopolis (there was also a stadium at Nicopolis); and 3. the large stadium or hippodrome found by the French near the Serapeion at the southwest corner of the city is probably that referred to by later Roman writers as the Lageion (although there is no evidence for it being called by that name in the Ptolemaic or early imperial sources). The argument for the wider width is that 20 years elapsed between Napoleon’s engineers measuring the remains, and the publication, and the editors misread the plan prepared by the former. The literary sources, then, refer almost exclusively to the Lageion, next to the Serapeum. 51. Lentz 1867–70 in GG 3.1: 1–547 + corrigenda in GG 3.2: 1233–40; cf. GG 3.1: xxxv–lxxi. Posted in From my diaryTagged Alexandria, Lageion, Serapeum1 Comment on View the Serapeum from above on Google Maps! The “grand colonne” at the bottom left is Pompey’s pillar – the pillar erected in the Serapeum by Diocletian. The temple stood on that squareish plateau, with the 100 steps of the entrance descending to the left around where the pillar is. The Arab “Chemin d’Alexandrie” (Alexandria road) runs to the east of the temple, along the Roman street. The left hand end of the stadium, is marked with “ruins”, where a semi-circular wall is visible, mostly at the north and middle. Distinct remains are visible at b-b-b. The most recognisable remains are at a-a-a. Notable in the picture is the “spina”, at c, the Roman centre structure in all their chariot-racing stadiums. The Greek stadium is narrow, intended for foot races; so the spina would be a later addition. But it was only just visible above the ground to Napoleon’s scholars. It was about 1m above the floor of the arena. At e was a hole for the meta, the cone-shaped turning post at the end of the spina. At d is a portion of a stylobate, from a temple frieze, some 2.3m high, next to the steps of an “amphitheatre”. Possibly part of the stadium was converted to a theatre at some point, as elsewhere. At f were remains of columns. At l the remains of a small obelisk. At o is the exit from the circus, leading to the necropolis. The interior length of the stadium was 559.37 m, taken from P-P. The internal width was 51.6m. The exterior length, between i and q, including the “amphitheatre”, is 614.6m. Pretty interesting, for a monument now vanished! There is a book on the architecture of Alexandria, by the same Judith McKenzie, accessible in Google Books preview here, which includes material on the Lageion, and seems frankly very interesting by itself.